Each week we will spotlight a different DPW artist who will give away one of their best paintings. 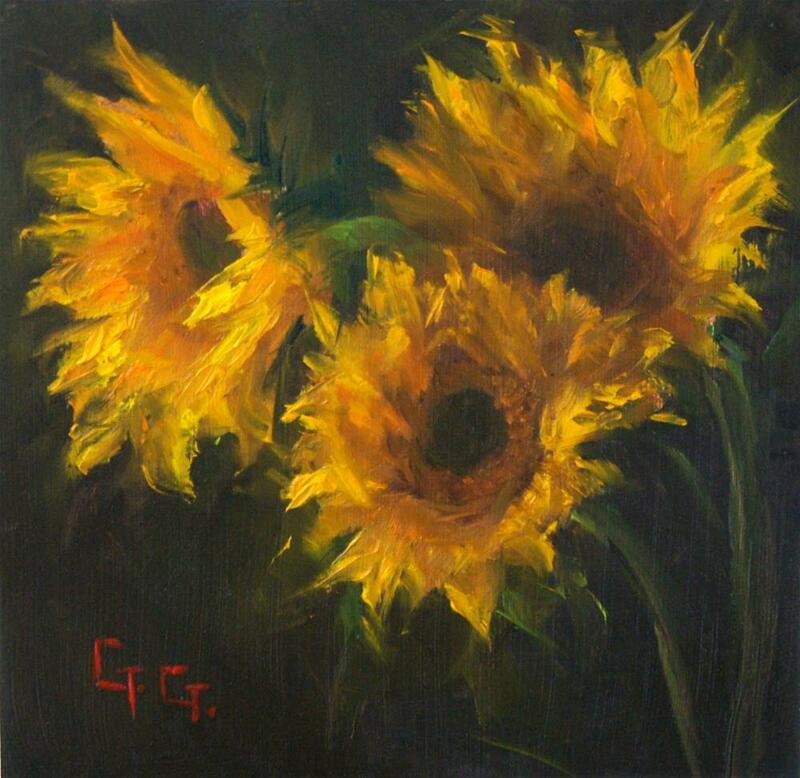 To enter to win Gail's painting, "Another Sunflower Painting" go to Daily Paintworks and click on the link at the top of the page announcing their interview. My interest in art was sparked over forty years ago when I was a theater production major in college and an aspiring scene painter. But life had other plans for me and more than twenty-five years passed before my passion was reignited. 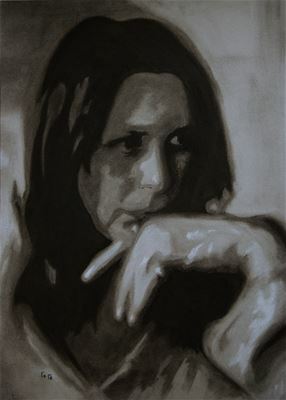 I worked first with pencil, then charcoal and pastels, and finally oils, while also trying my hand at portraits, figures, still life and landscapes. I first picked up a paintbrush in 1973. I was at Carnegie Mellon University majoring in Theater Production and was assigned to a scene painting crew. I loved it and I was convinced I wanted to do this for the rest of my life. That lasted about six years before I changed paths again. However, during that time, I had to take a test to join the Scenic Artists Union and one of the requirements was to paint a landscape. I was good at painting faux wood and marble and stenciling wall paper and making a flat piece of scenery look three dimensional, but I knew nothing about fine art. I even attended classes at the Art Students’ League in New York for a month or two. But life got in the way and it wasn’t until the 1990’s, when my children were in school, that I thought about taking art lessons again. I started drawing with pencil, moved on to charcoal and pastel and then finally to oils. As soon as I picked up a brush, I was hooked all over again. I didn’t have any stops and starts since I started drawing classes twenty years ago, but I didn’t really get serious about my painting until rather recently. When my children were grown and out of the house, I set up a studio, spent more time in classes, and traveled to workshops. In the past, painting was just something I did when I had the time. Now it is something I want to do all the time! Enter to win by clicking on the link at the top of the DPW home page announcing Gail's interview. When I was in college, I did some watercolor copies of my favorite Andrew Wyeth paintings. When I returned to art in the 90’s I started drawing portraits in pencil and charcoal, and then soft and oil pastels. 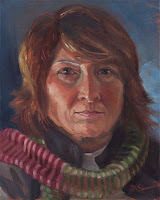 Working from photographs, I did a series of drawings called Portraits in Courage. I was inspired by those who had experienced hardship and loss yet had endured and grown stronger. I wanted to show the wisdom that was written in their faces. Feeling confident enough in my drawing skills I started painting figures in oils, but only in blacks, whites, and grays. I did a series of 30” X 40” paintings, entitled The Park Bench, depicting people from all walks of life as they took a break from their busy lives. Eventually I moved on to color and worked from live models. Now I am concentrating mostly on still life and trying my hand at landscape and plein air. 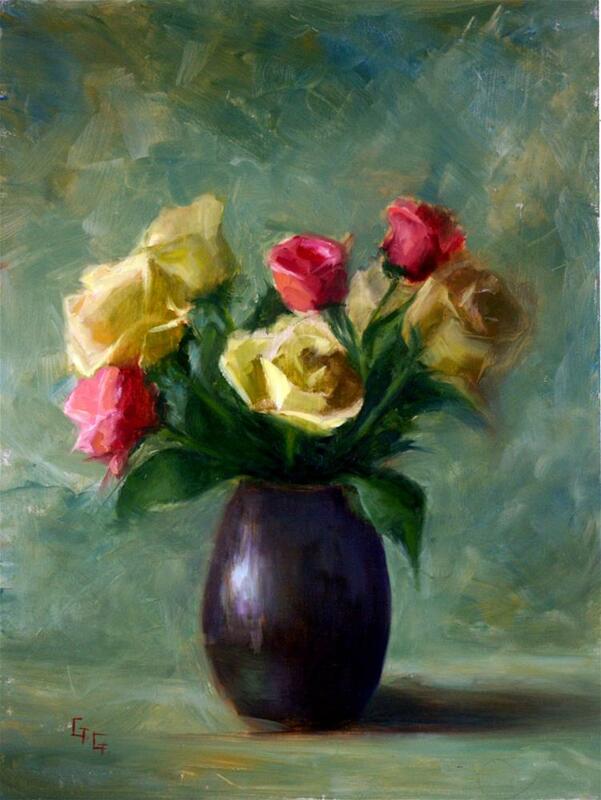 I have taken a few pastel classes too, but I always go back to oils. Which ones have “stuck” and which ones have fallen away? I am deathly afraid of watercolors now. I love that oils can be reworked at any time long after they are signed and considered finished. I have paintings framed and hanging on my walls that I revisit years later. Watercolors are much less forgiving. I tried acrylics for about six months and hated it. I didn’t like the feel and flow of the paint and I couldn’t get used to how fast they dry. It just frustrated me. When I started drawing I only did portraits. But I worked primarily from photographs and now I don’t find that satisfying. Although I still enjoy painting from live models, I like the control of the shapes and composition, and the play of light and shadow that I have when painting still life. Landscapes, seascapes, and snowscapes are my current challenge and I want to spend more time painting plein air, rather than from photo references. 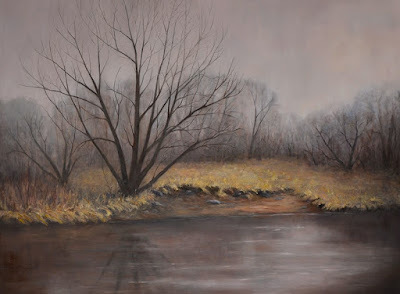 I would also like to try abstracting the landscape and I am interested in learning how to use a palette knife for more than just detail at the end. I love the look of pastels and am often tempted to try them again. Color mixing with pastels is so different from oils that it’s almost like learning a new language. 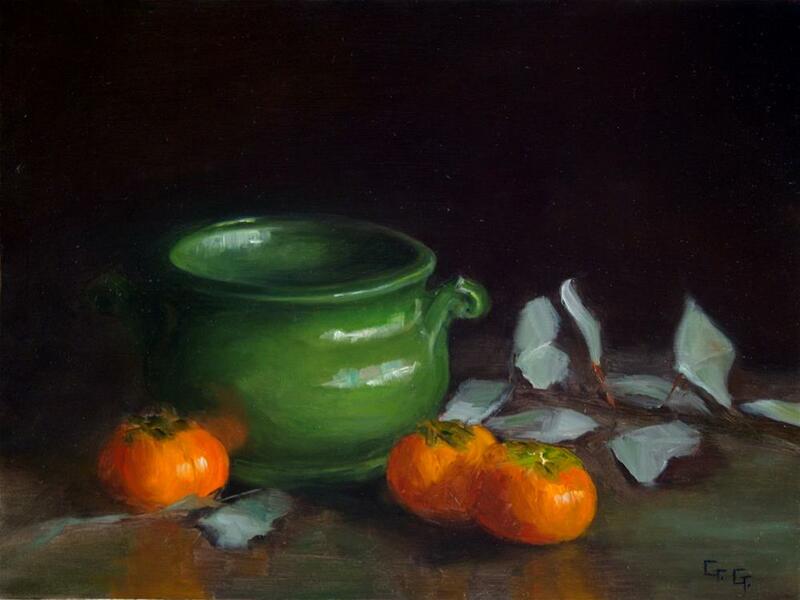 The work of Patty Nebbeling, my teacher at the Ridgewood Art Institute in NJ, inspires me to loosen up and simplify. Peter Fiore, a landscape painter whose workshops I have taken, inspires me with his brilliant use of color. John MacDonald, another landscape artist and teacher, inspires me with his beautifully atmospheric paintings. 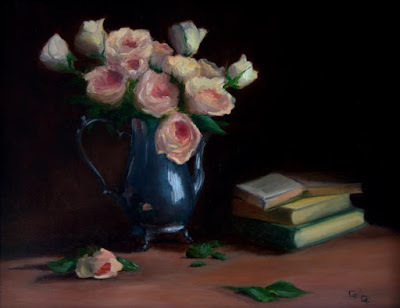 I find inspiration from many contemporary still life and plein air painters, such as Qiang Huang, Neil Carroll, Kathie Odom, Nancy Tankersley and Roger Dale Brown. I love the masters. I am particularly drawn to the drama of light and shadow of Rembrandt and the freedom and color of Cezanne and Van Gogh. And just about everything in Sargent’s paintings. 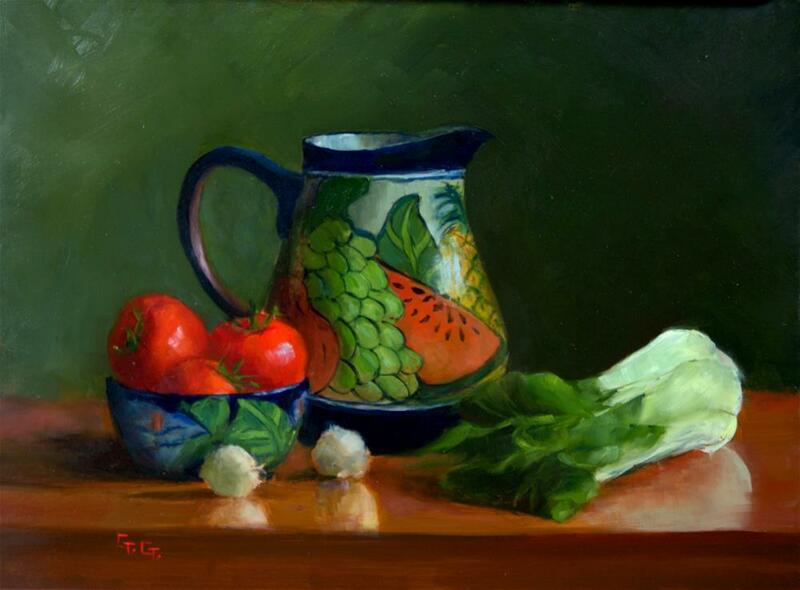 I am always intrigued by the play and drama of light and shadow on a still life or landscape. But sometimes it is the lack of contrast and the more tonal, monochromatic setting that inspires me. Other times it’s the colors or the strong shapes and values that attract me. What is your mental preparation for painting? I don’t have any preparation protocol, but I listen to books on my ipod while I paint. I always make sure I have something riveting to listen to. Right now it’s “The Alice Network”, about women spies in WWI and WWII. It’s very good! I think I do more daily procrastinating than I do daily painting. I am getting better however. I find it most difficult if I am starting something new and don’t have a plan. Once I am working on something I find it much easier to get going. For me it is like going to the gym; once I have my gym clothes on and I walk out to the car I will go and work out. I just have to get myself into the studio. Once I am there the hours fly by and the next thing I know it is evening, I am exhausted, and it’s time for dinner. Every Wednesday I am in a class where the teacher generally assembles half a dozen setups to choose from. I might tweak them a little. Sometimes a piece of fruit or flower she has brought in will inspire me and I will do my own composition. At home I work from photos. Lately I am concentrating on landscapes and seascapes from photos I have taken during my sailing trips. Many times I will see another artist’s work and it will remind me of a photo reference I have but didn’t think could be a good painting. That will inspire me to find that photo and give it a shot. This past summer I started painting plein air from the back of our sailboat, painting whatever scene is in front of me at the time. It’s always paint worthy! I haven’t experienced burnout yet, possibly because I am always learning and trying new things. 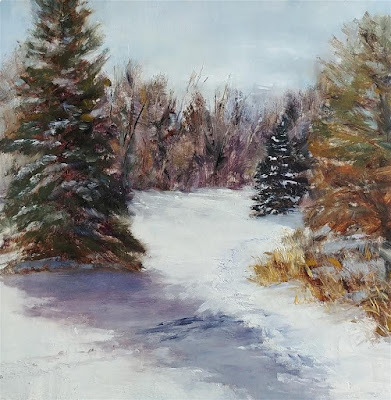 Painting landscapes is new for me, and I am just starting to paint en plein air. Recently I started using a palette knife whenever possible and I am experimenting with making my style looser and more painterly. If I feel like a particular painting is bringing me down I will put it aside and paint something else. I am striving to learn how to simplify and loosen up and know what to leave in and what to leave out. I think that is the essence of a successful painting. I am also learning that photo references can only take you so far. You need the experience of painting from life to be able to interpret and extrapolate the information in a photo and turn it into a work of art. That seems especially true of landscapes. I am happiest when I am learning or trying something new. I love exploring. I also must admit that I am most happy when my efforts culminate in a successful painting. And I am ecstatic when someone else is moved by my work and loves it enough to put it in their personal collection! Each week we will spotlight a different DPW artist who will give away one of their best paintings. To enter to win Anna's painting, "Milk Jug" go to Daily Paintworks and click on the link at the top of the page announcing their interview. Probably just like everyone, I had some attempts at art during my school years. Actually, some level of painting and drawing was obligatory for my first school. I'd been studying at Waldorf school up to the last four grades. This education system strives to emphasize imagination in the learning process through artistic and intellectual development of pupils. I don't remember ever using textbooks except for grammar and maths there. All the possible illustrations and schemes for history, physics, you name it, we used to draw in our copybooks by ourselves under the supervision of our teacher. We even had a subject where it was our home work to paint several illustrations about some part of a story that was read to us. Sometimes I think that I remember information learned in that school better because I had to paint most of it. Unfortunately my Waldorf school was closed and I went to state school where I was pressed by my parents to get serious and chose a normal profession, even though by that time I started considering becoming an illustrator. But well, I listened to my family as I sincerely believed that they were the wise adults and knew what was best for me. The next time I started to think about drawing again was only when I got married. I'd been looking through CG illustrations for some months, some were too beautiful to even think about that level of mastery, others were painted by amateurs, but nice nonetheless. At one point, after watching another tutorial I thought: how much longer am I going to just look? I needed to try it myself. Seeing my interest, my husband made me a Christmas present - a tiny drawing tablet. At the beginning it was an awkward experience, but I still keep the very first picture I painted on it, it is absolutely terrible. After several months of playing with this new toy, something nice started to come out of it. It was fun and I became thoroughly engrossed in CG painting, but my works were lacking. I'd been enthusiastically stumbling in the dark without any understanding. So after two years of painting on the computer in my free time, I resigned and found an art school not far from my work. I started from the basics and found that I feel extremely motivated when I pay for my own education. I had surprisingly fast progress in pencil drawing and after some thirty lessons my teacher started to nudge me to try first watercolor and then oil. So I would say that officially my oil painting started only two years ago. 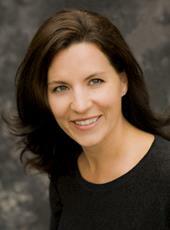 Enter to win by clicking on the link at the top of the DPW home page announcing Anna's interview. 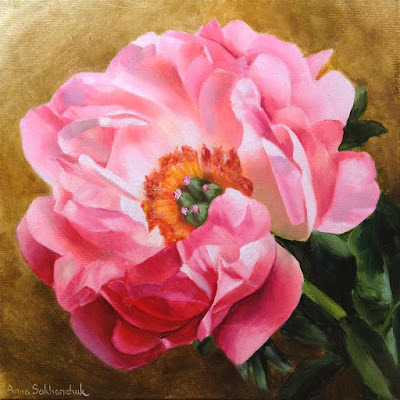 I feel that currently I'm in the very beginning of my painting career and as my art finally started to bring some money I doubt that my very supportive husband would give me any chance to stop. I started with gouache and crayons at primary school, then moved to watercolor pencils and watercolor washes. Without any art education I was free to happily mix watercolor with gouache and thoroughly enjoyed it, fortunately I don't know where these works went. Tried pastels and acrylics for a few months. I love painting people on the computer but have never tried it with oil. Returning to watercolors after painting on the computer was a humbling experience. I started to paint flowers because ten years ago, when my mum asked me to paint red roses on her wall they turned out more like tomatoes, so I decided to learn it finally. Of course I still make sketches in pencil, I like to spend an evening painting something on my iPad. Currently, I'm striving to master oil. I feel like I like to look at watercolors more than I enjoy painting them. Others have fallen away. I would like to play a bit with acrylics this summer, maybe do some studies in my garden and in the forest. Also I want to try figurative painting, though I'm not sure that I'm ready for it. Nature and countless wonderful artists. I'm in love with academic painters of 19th century, charmed with contemporary American realism painters and I am in constant awe of CG artists. I'm not able to make myself paint in the morning. I only managed it at art school and just because my teacher worked in the first part of the day. Several times a week I promise myself that I'll start at least at noon, but in the end I find a dozen seemingly important chores, interesting articles in the internet, can't stop reading that story or weather is too good to miss, and as a result I drag myself to my workplace around 5 o'clock. Interesting audio books help a lot, otherwise my thoughts tend to stray and I go search for the answers online. I'm not able to do anything while listening to audio books so it is a perfect combination with painting for me. Also my husband is so supportive that he doesn't let me be overcome by my laziness. I may see some beautiful fruit in the supermarket and buy it just for painting. Once I bought just one small plum because it had a nice leaf attached. I like to walk through the forest with my camera and visit botanical gardens. I love to paint from life, but quite often I make a photo for future use because at the given moment I may not have time or enough skills for it. Some photos I find in the internet, but I rarely like painting from them, it is too difficult to find something that feels right to me. When I get frustrated I change the subject or the medium. From time to time I can't stand painting at all, usually a day of different activities helps. Last autumn when I went camping on Ladoga islands I took with me everything for painting and just felt that I didn't want to paint, so I spent two days just laying on the rocks and gathering berries. But by the second night I started to sketch the moon road and a boat on the back of my book despite the lack of light. I feel like I'm at the bottom of my ladder and the skills I want are somewhere around the moon. Right now I would like to learn looser technique and the one with the pallet knife, also I need to work on my volume and I strive to understand the composition. I love the process of creation, but the second best part is when my works find a new home and I get feedback. I'm not very interested in my paintings after I finish them, but it brings me real joy to know that they made somebody happy. Each week we will spotlight a different DPW artist who will give away one of their best paintings. To enter to win Nelia's painting, "Across the Pond" go to Daily Paintworks and click on the link at the top of the page announcing their interview. Nelia Harper is a landscape painter who seeks to capture the aesthetic beauty of nature, and create an intimate connection between the viewer and the natural world. 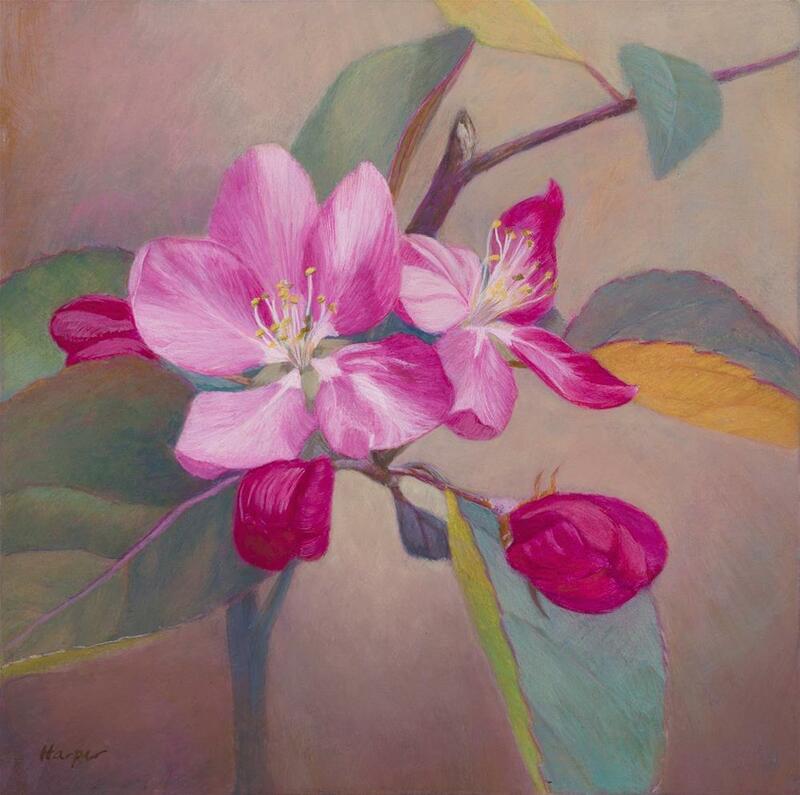 A life-long creator, Nelia has engaged in artistic expression through photography, collage, and paper and fiber arts, before committing to painting with formal training. Her education began with college level drawing courses and continued under the instruction of Janeen Schissler, at the Schissler Academy of Fine Arts in Loveland, Colorado, where she worked primarily in pastel. Well, like a lot of people I know, I loved to draw and paint when I was a kid. I remember my mom subscribed to a magazine that had pictures of paintings – I think it was called Victorian. Anyway, I would look at paintings by Monet and The Impressionists. I remember thinking, “I want to be like that when I grow up.” I thought it was so adventurous and romantic. But, like many artists I know, I dropped the idea of art and painting. I went to college and then found a 'real job' that would 'pay off'. Then, while I was on vacation in Paris, I remember standing in front of a painting in the Musee D’Orsay thinking, “How do they do that? I need to learn how that do that.” The feeling was overwhelming. I remember looking at the dabs of color on the canvas and stepping back to see a complete image. How did they make it looks so real? I wanted to step into those paintings. I knew there had to be a way to learn, and even if I wasn’t any good at painting, I could still have fun learning. So, I took a six week acrylic painting course, and I was hooked. From there, I decided to take a drawing course at our local community college. After that, I kept taking classes and workshops. 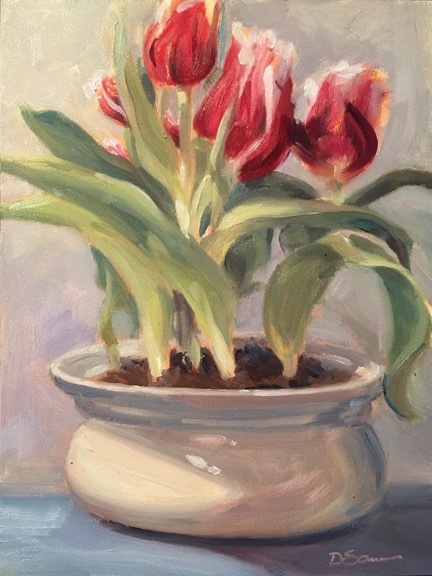 I joined a plein air group and worked on my own too. It was almost exactly six years ago that I took that first painting class, and my interest in painting and art has only grown since then. Enter to win by clicking on the link at the top of the DPW home page announcing Nelia's interview. Well, I’ve really just gotten started in my painting career, and I hope to keep going. I’ve worked in a variety of mediums: oil, pastel, egg tempera, gouache, watercolor, graphite, charcoal, acrylic, ink, markers… I’ve done a little experimenting with abstract painting and illustration. Oil has definitely stuck. It’s easy to use, transportable, and versatile. I paint regularly in pastel, sometimes using a watercolor or oil underpainting, and egg tempera. Watercolor is mainly reserved for travel journals and painting with my nieces and nephews. It sounds strange to say when the other mediums take more time, but I just don’t seem to have the patience for watercolor. As I get better at color mixing and drawing, I hope to paint in egg tempera more frequently. Even though it’s incredibly time consuming, it is such a luminous medium, and I enjoy making my own supports and building up layer after layer. I would have to say nature inspires me the most. It’s so easy to take nature for granted. Looking at a sunset, the shapes of clouds, the incredible colors in a bird’s feather, the variety of trees, flowers, landforms, and of course people. Everything comes from nature. We forget that we are part of nature and the endless creation of life. When I think about what it takes to create and support life on this planet, I’m endlessly amazed and intrigued by the diversity that nature provides. That’s easy (laughs). Being busy! I joke that my favorite form of procrastination is “productive procrastination”. I can always find a project in the garden or around the house that needs to be done. And, I’m forever organizing my studio to make room for my next project. I converted a small basement bedroom into a studio. There’s just enough room for me, a canvas, painting supplies, a table, and some tools. It feels like I’m constantly putting things away to make room for the next painting project. 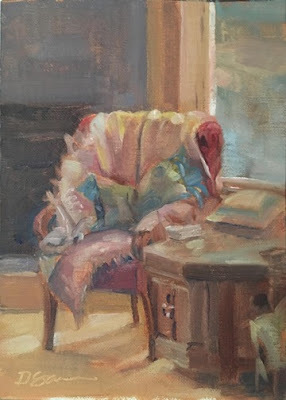 If that fails, there’s always a good book to read, an art show, a plein air paintout, a new technique to read about or watch on YouTube, or supplies to research and buy, not to mention looking at artwork on Instagram. My favorite technique is agreeing to participate in a show with fellow artists. That seems to get the fire going more than anything. We have a strong art community in our area. So, typically we have to reserve space for a show at least a year in advance. Because I am showing my artwork along with artist friends, we are always working to improve our skills and show off for each other. And, we all paint en plein air together. Every Friday, our plein air group paints together at a set location. Sometimes we’ll paint together on other days too. Getting outside with friends is always a good motivator to paint. I also like to submit my work to juried shows at least 2-3 times a year. Knowing that I have a show to prepare for keeps me busy in the studio. Having friends to paint with keeps me painting outside and motivated for the next show. And, I have a couple of music playlists on Spotify (music app) that help get my mind in the groove too. Ideas for painting typically form while I’m hiking, painting en plein air, traveling, or daydreaming. I’m usually inspired by shape and color. I often feel a small wave of excitement. Usually that feeling will last, nagging me to paint it. Sometimes it’s a really bad snapshot with the cell phone, but I’ll see the idea fully formed in my mind. When it stays in my mind’s eye and it feels good, I know it’s worth painting. Luckily I’m still new to painting so I haven’t had a feeling of burnout. As I look back, I realize that I am good at challenging myself with small risks that have potentially large rewards. 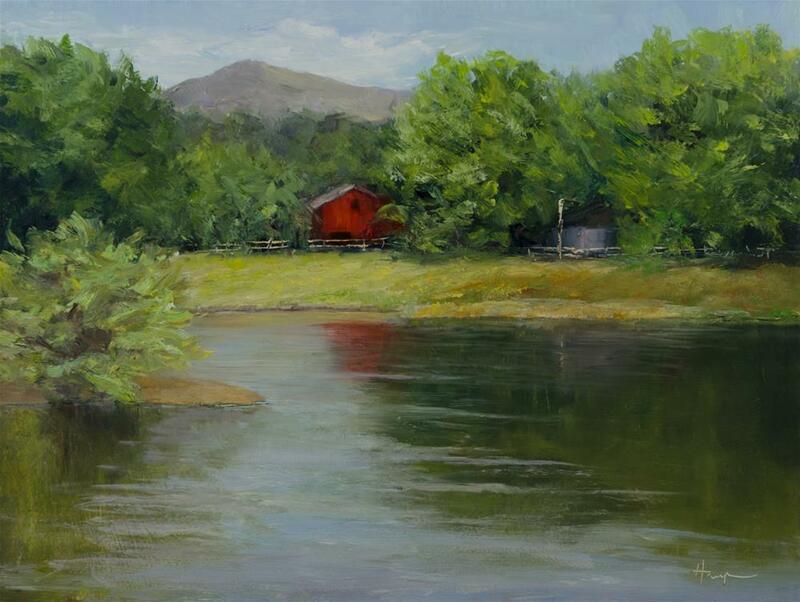 For example, I joined the Steamboat Art Musem’s Plein Air Event last fall. For a $50 entry fee, I was able to experience a week-long plein air paintout, art show and competition. Attending with several friends kept the cost down, and I sold a painting at the show. 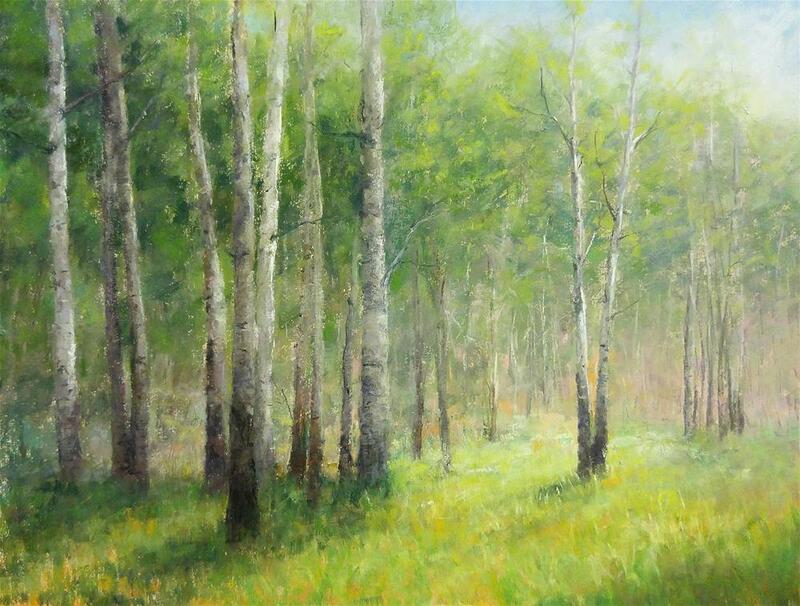 I learned so much about plein air events, framing from the car, and traveling to paint. Mostly, I find ways to challenge myself with small risks: paint larger, paint smaller, paint more realistically, more loosely, things like that. Right now, I’m learning portraiture and figure (back to the community college). 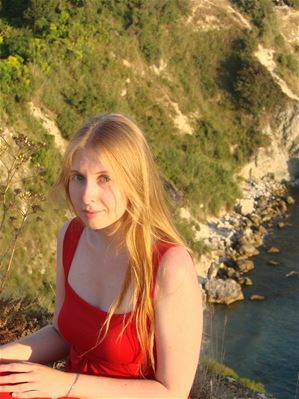 I also want to paint more complex scenes, buildings, flowers…there are so many challenges yet to paint. The ideas keep me going. Hmmm… this is a tough question. From a technical standpoint, I would say that I’m learning about light. How it affects color and form, especially on the human body. From a philosophical perspective, I’m learning about the value of beauty and living a joyful life. For so long, I pushed myself in a career, I focused on society’s idea of success (the accumulation of things and prestige) and I lost my way. Now, I think about what really matters: the human experience and how I want to enjoy living. Once a piece leaves the studio, the influence of that artwork is often unknown. For example, a few years ago, during our holiday art show, an elderly gentleman bought a print I had on display. It was a print of an egg tempera painting, depicting a scene in Italy – a small courtyard with flowers. He asked me questions about the location, and we chatted for a bit about our travels. He used to travel for work and lived all over the world. I shared with him the story of the hilltop town and the process of creating the painting. He dug into his pocket for some cash, and bought the print. I signed it for him, and after a few more minutes, we wished each other a ‘happy holiday’ and parted. The following year, as I set up for our annual holiday show a fellow artist came over and asked me, “Do you remember Harry, that older gentleman that bought a print from you last year?” Of course I remembered him. We had a really nice talk, and he was so excited about that print. She told me he kept that print right next to his bed. He looked at it every day. It reminded him of the places he had lived and he kept it close to him. A few months after we met, he died. Each week we will spotlight a different DPW artist who will give away one of their best paintings. 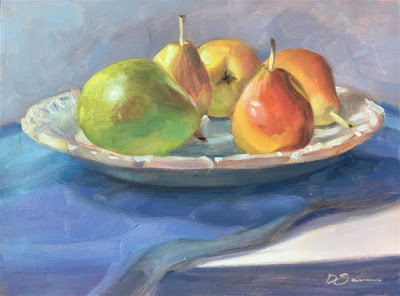 To enter to win Deborah's painting, "A Little Bit of Spring" go to Daily Paintworks and click on the link at the top of the page announcing their interview. Graduated from Moore College of Art in Philadelphia majoring in Illustration with a minor in painting. After 28 years of working as an art director I wanted to explore my love of oil painting. 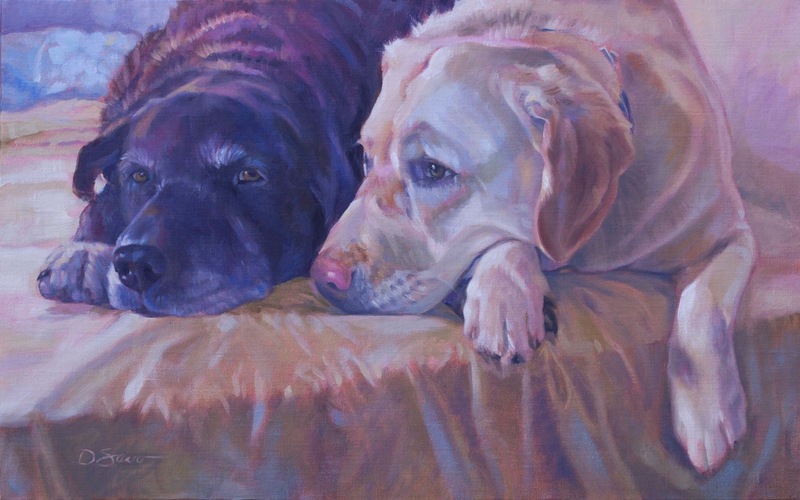 I love to paint people and animals and I'd love to start doing some plein air work and continue to explore light, color and composition. I had a love of art from a small age. My mother was very creative and encouraged my creativity by buying me different art supplies. I remember spending many lazy summer afternoons playing with my watercolor set. In college, I majored in illustration and minored in painting. After graduation, I worked doing graphic arts and illustration but remember knowing that I’d return to my love of oil painting. A few years ago when I retired, I pulled out my paints and started to play around. I painted in college, and other than my illustrations, I didn’t paint for many years. Unless you count the many school play sets I painted when my kids were in school. I always felt like I didn’t have the time to devote to painting. 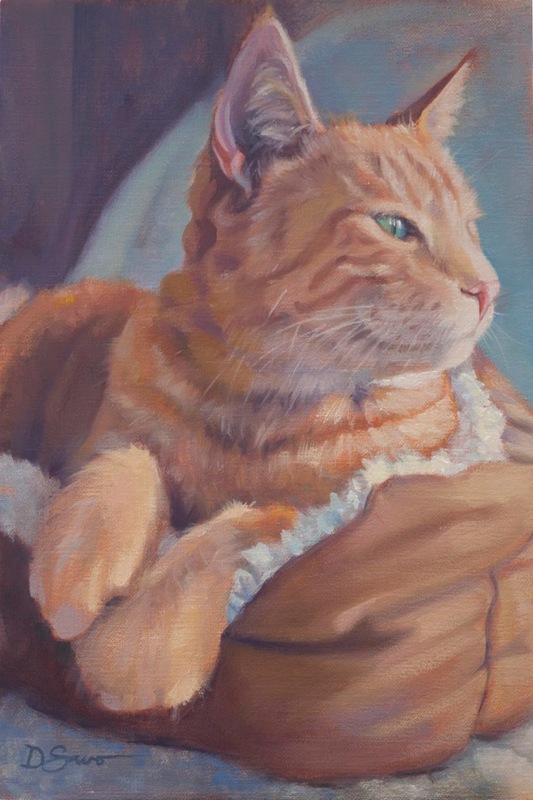 After working in graphics for thirty years I wanted to go back to developing my oil painting. At first I played around with the skills I had and did some pet portraits, they are still a love of mine. During my internet researching I came across Carol Marine’s name and daily painting. This spurred my interest in daily painting. I loved her little paintings; they are so fresh and full of life. Enter to win by clicking on the link at the top of the DPW home page announcing Deborah's interview. My first illustrations were done in watercolor and colored pencils. Many years ago I worked in an in house corporate art department. While I designed booklets and brochures, I also did some illustrating. These were mostly technical product renderings. But my favorite thing I did were these caricatures of people who were retiring or receiving awards. I continued to do these for about twenty years. Painted only a handful a year but enjoyed the opportunity to paint because, during this time, most of my designing and illustrations were created on the computer. My current paintings are oils. I have a great love of animals and do pet portraits by commission. 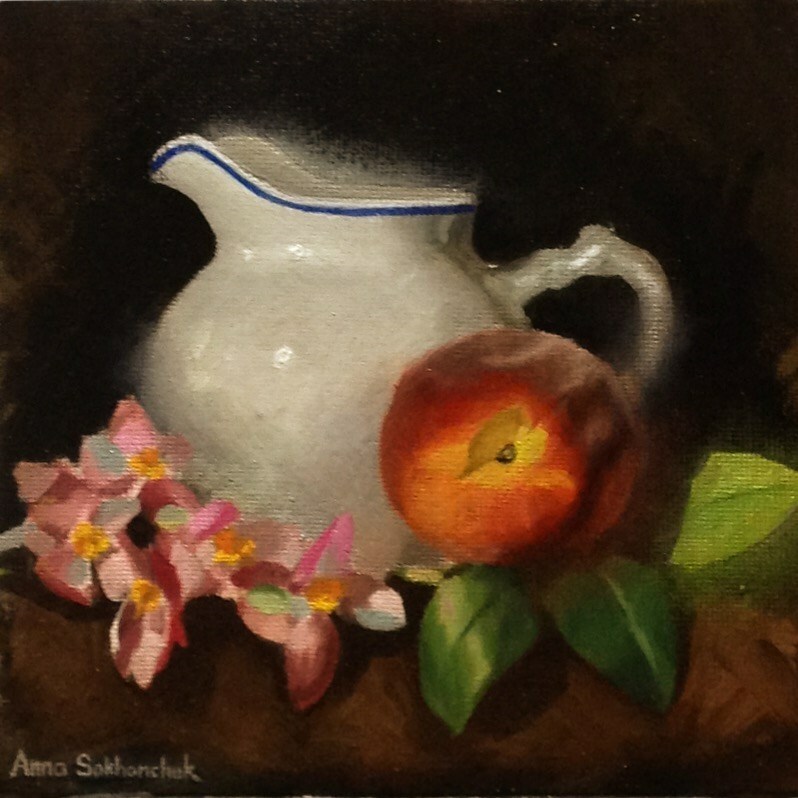 Other genres are still lifes and some florals. Attending a class at a local art center spurred my interest of alla prima and plein air painting. I’ve always loved painting oil. I haven’t painted in watercolor in years but still love the luminousity that the media has. 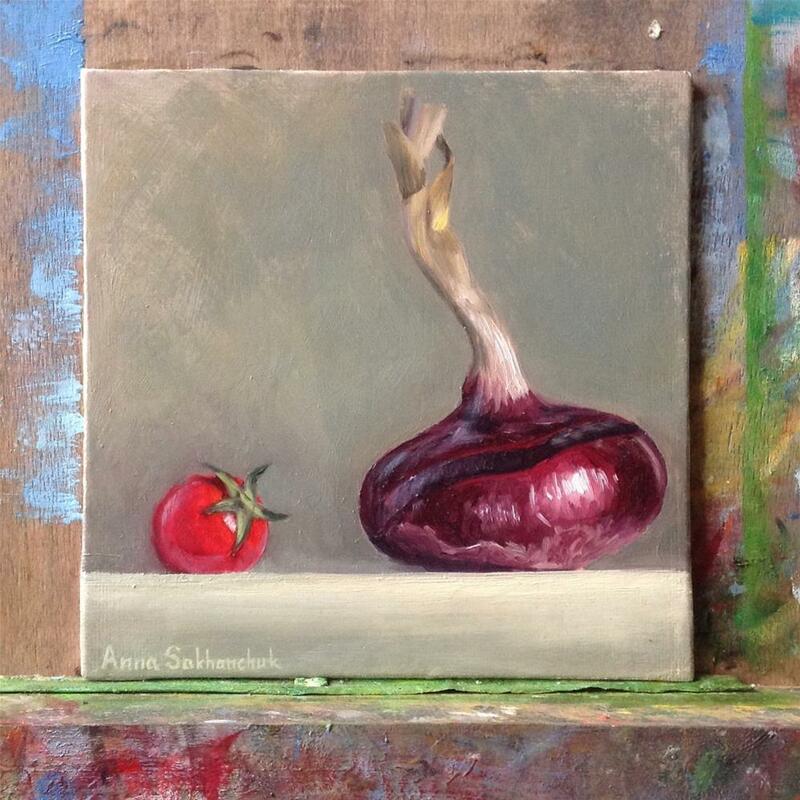 Right now most of my paintings are alla prima still lifes but I’d like to further my skills in plein air painting. My favorite artist of the past is John Singer Sargent. There are too many artists of today that I aspire to. I’m drawn to the impressionistic and figurative painters. The looseness of their brush strokes and use of color amazes me as it is something that I struggle with. Procrastination is a big thing that I struggle with. I can waste a lot of time browsing the internet looking for inspiration and get caught up in looking at other artists. While I think it is important to look and learn other artists, I spend too much time looking and not getting to work on my own paintings. I’ve participated in a couple thirty day challenges and they’re really helpful keeping me on a schedule. 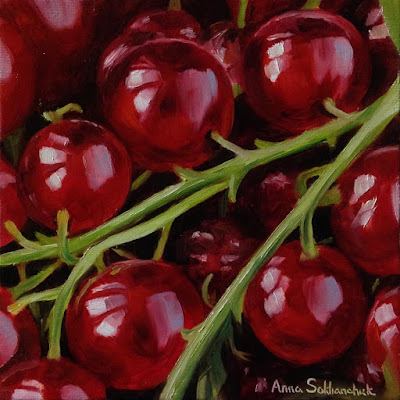 Sometimes I go to the store and buy a bunch of pretty fruits and vegetables and they inspire me to paint them. I also have a cabinet of things I’ve collected that I thought would make a great painting. I love to grab my camera and ride my bike around town looking for interesting places to paint. I find myself taking mental notes as I’m driving…great skies, colors in the shadows, an interesting tree, an old barn. Mostly it’s the lighting that grabs my attention. I often have to remind myself to pay attention to driving. I try to only do this when I’m the passenger! Looking at other artists past and present. I’ll pull out a book or search an artist I’ve heard about. I also listen to art podcasts. Listening to other artist talk about their struggles and inspirations helps me with mine. Right now I feel like a baby artist. Sometimes it overwhelms me how much there is to know. 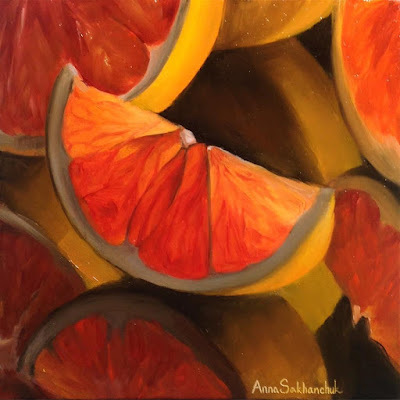 My use of color and brushwork is my main focus. As an illustrator everything was very tight and I have to constantly remind myself to be looser and not to get caught up in the details. I love being an artist and it is a constantly evolving journey. When I hear from a viewer that it made them smile or evoked an emotion.